Here is a quick introduction and pdf tutorials about SAP CRM middleware. You can refer Sub components , Tcodes and PDF Tutorials.SAP CRM has an inbuilt tool called Middleware to enable communication and data transfer between SAP & non-SAP systems. It can control and monitor the data between these systems. For large CRM implementations companies are appointing middleware specialist consultants to do the configurations and setup. For using SAP CRM middleware tool, it doesn’t require new infrastructure or equipment’s like server, software etc. It already available with SAP CRM Software, we need to configure as per the requirement. It using various adapters to establish connection between different systems like XML / Doc, SAP R/3 , Mobile clients, SAP BW, ASCII etc. We need to activate and configure these adapters as per our need. 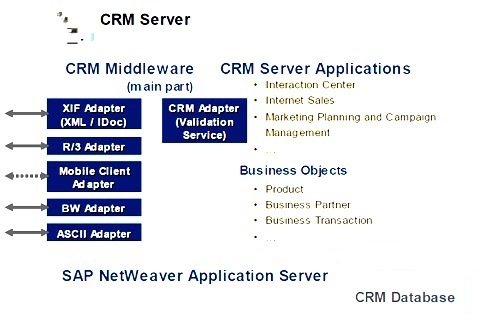 See the picture which shows SAP CRM architecture and middleware adapters. How to convert BDoc messages into XML ?